Taco Maria, the highly anticipated brick-and-mortar version of the critically acclaimed gourmet food truck, is now open in Costa Mesa. Executive chef Carlos Salgado brings his decade’s worth of experience off the road and into the white-hot OC Mix at South Coast Collection marketplace, where he is serving modern Mexican-American “Chicano” cuisine built upon seasonal flavors and contemporary techniques. For more information, visit www.tacomaria.com. Dinner nightly. Taco Maria, OC Mix at South Coast Collection, 3313 Hyland Ave., Costa Mesa, CA 92626, 714-538-8444. Orange County’s latest foray into the gastropub-style culinary milieu, The Blind Pig Kitchen + Bar, is now open. Located in Rancho Santa Margarita and armed with a name inspired by a slang term for "speakeasy," the restaurant features executive chef Josh Han’s take on farm-to-table small plates with adventurous accents. The venue also appropriately offers a host of hand-crafted cocktails featuring fresh ingredients and house-made mixers. For more information, visit www.theblindpigoc.com. Lunch & Dinner Tue.-Sun. 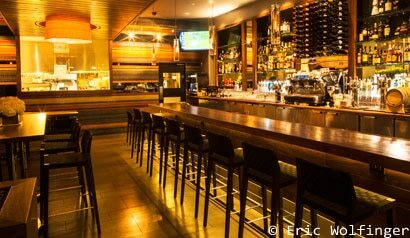 The Blind Pig Kitchen + Bar, Mercado Del Lago, 31431 Santa Margarita Parkway Unit M, Rancho Santa Margarita, CA 92688, 949-357-5553. Lark Creek Newport Beach has opened at Fashion Island. The restaurant marks the first foray into the Southern California market by the San Francisco-based Lark Creek Restaurant Group, who operates 11 venues in and around the Bay Area. Much like their Northern California counterparts, the restaurant offers a chef-driven menu of contemporary cuisine featuring local, seasonal ingredients to pair with a host of California wines, artisanal cocktails and craft beers. For more information, visit www.larkcreeknb.com. Lunch & Dinner daily. Lark Creek Newport Beach, Fashion Island, 957 Newport Center Dr., Newport Beach, CA 92660, 949-640-6700. Clay Oven in Irvine is offering a special prix-fixe menu to raise funds for the fight against breast cancer. Executive chef and breast cancer survivor Geeta Bansal is putting together a special three-course offering all throughout October, which is Breast Cancer Awareness Month. Select courses include forbidden rice with roasted tomato and cumin soup; chicken curry served with rice and naan; and rose panna cotta. The cost is $40 per person; a portion of all sales will benefit the Susan G. Komen foundation. For more information, visit www.clayovenirvine.com. Clay Oven, Irvine Village Center, 15435 Jeffrey Rd., Irvine, CA 92618, 949-552-2851. SideDoor, the gastropub that is attached and affiliated with the legendary Corona Del Mar eatery Five Crowns, has announced that it expanded its dining area to the property’s greenhouse patio. The new area will enable guests to enjoy the venue’s weekly rotating menu of seasonal contemporary cuisine in an English garden environment with fire pits and intimate lighting. SideDoor, Five Crowns, 3801 E. Coast Hwy., Corona Del Mar, CA 92625, 949-717-4322. David Fuñe has been announced as the new chef at Splashes, the flagship restaurant at the Surf & Sand Resort in Laguna Beach. This marks a return to Orange County for Fuñe, who had previously manned the kitchen as executive chef at Savoy, the now-defunct restaurant at the also now-defunct Hotel Hanford in Costa Mesa. Splashes, Surf & Sand Resort, 1555 S. Pacific Coast Hwy., Laguna Beach, CA 92651, 949-497-4477. Aron Habinger has left his post as executive chef at The Crosby. Habinger leaves the hip downtown Santa Ana eatery after five years of overseeing the kitchen. Chef Linh Nguyen is being promoted to the position, where he will be continuing the restaurant’s vision of making contemporary cuisine and daily-rotating chef's specials. The Crosby, 400 N. Broadway, Santa Ana, CA 92701, 714-543-3543.